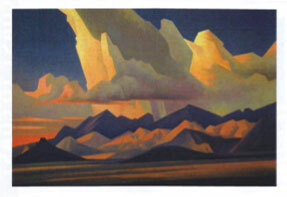 Ed Mell says his work is sometimes the result of "happy accidents." This is a good example of Louis Pasteur's observation that "chance favors the prepared mind." With a highly developed sense of design honed during a career in advertising and illustration, Mell prepares sketches and small studies before he begins his paintings. He is prepared for those "happy accidents" and those times "when painting more abstract paintings they kind of invent themselves." 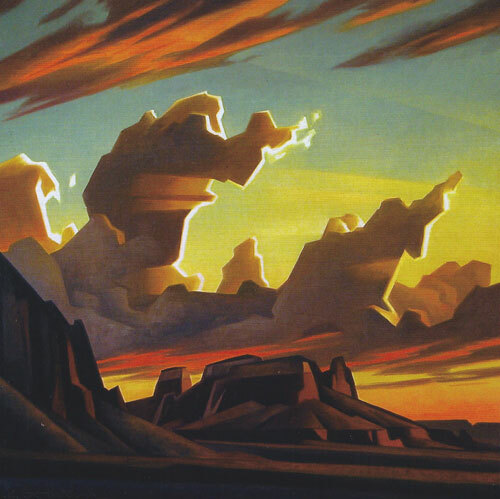 Says Dr. Mark Sublette, president/CEO, Medicine Man Gallery, "Ed Mell is an original voice when it come to depicting the West, not only in oil but also in sculpture, A one of a kind." 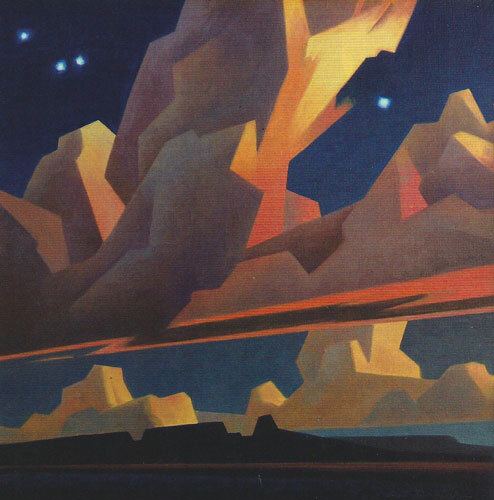 Ed Mell, Evening Edges, oil on linen, 22"x22"
Mell paints monumental landscapes monumentally, pushing reality to convey the impact of his actual subject. His mountains and mesas lose their subtle details and become simplified geometric forms. Clouds rise and rain falls but Mell gives each of them mass and solidity as in Sonoran Cast. As he has said, "You remember basic forms, color and mood. The details are lost, but the image remains. The landscape is too dynamic to interpret realistically...." At other times the solid masses of clouds become translucent as Mell paints extraordinary skies as in Morning Sun. Mell's roots are in the Southwest, having been born in Phoenix and having attended the Art Center College of Design in Los Angeles. He returned to the area after his advertising career had taken him to New York for several years. It was a summer teaching silk screening and drawing on the Hopi reservation in Northern Arizona that convinced him that he had to move back to Phoenix with a new appreciation for the area. He opened an illustration business but began painting landscapes in his spare time. Ed Mell, Morning Sun, oil on linen, 22"x22"
His part-time hobby became a full­ time career that has seen his painting of Cathedral Rock in Sedona reproduced on a first-class stamp by the U.S. Postal Service commemorating the centennial of Arizona's statehood. It has also seen his work enter major corporate and private collections as well as those of major museums such as the Phoenix Art Museum and the Booth Western Art Museum in Cartersville, Georgia. Ed Mell, Sonoran Cast, oil on linen, 20" x 30"
His work also has been exhibited in museums across the country. Mell sees and paints the "real magic" of the Southwestern landscape, "happy accidents" and all. Mark Sublette Medicine Man Gallery will mark the grand opening of its new Tucson location at 6872 E. Sunrise Drive, in Ventana Village Center, with an exhibition of new works by the artist titled Mell Modern. The grand opening and artist reception will be Friday, November 16, from 5 to 7 p.m.